Old Number 7 Blogsphere – Page 221 – Unrelated to the whiskey. Copyright trolls are companies that make a business out of monitoring file-sharing networks for illegal downloads and instead of trying to prevent them, try to cash in instead. In letters sent to alleged file-sharers, copyright trolls use often complex and threatening language in order to imply something terrible will happen if recipients don’t pay between hundreds of pounds and thousands of dollars to make supposed lawsuits go away. During September 2014, TorrentFreak became aware of a UK court case titled TCYK LLP v British Sky Broadcasting Ltd. TCYK stands for The Company You Keep and is the title of a film of the same name directed and starring Robert Redford, appearing alongside Susan Sarandon and Shia LeBeouf. In court, TCYK LLP forced Sky to hand over the names and addresses of subscribers alleged to have downloaded the movie without permission. Earlier this year the ISP warned affected subscribers of what might come next. “It’s likely that TCYK LLC will contact you directly and may ask you to pay them compensation,” Sky noted. Sky were correct on both counts. Before the weekend TorrentFreak obtained a copy of the letter now being sent out to Sky subscribers by TCYK. It’s the usual framework of veiled and direct threats, designed to intimidate users into handing over hard cash. “Our forensic computer analyst has provided us with evidence that on the following UK date and time, [redacted by TF], all or part of the Work was made available from the internet protocol (or IP) address [redacted], specifically for the purpose of downloading by third parties,” the letter reads. We have redacted the time and date to protect our source but it is noteworthy that the alleged offense was carried out more than two years ago in April 2013. In a common feature of these claims, TCYK go on to admit that they have no proof that a specific person committed the offense and that they have simply targeted the bill payer instead. They then pressure that person to help them build a case. “In the event that you were not responsible for the infringing acts outlined above because, for example, another member of your household was the user of the computer, you should make full disclosure to us of the other parties at your residence using your internet connection to make the Work available for download,” TCYK note. Of course, no subscriber is under any obligation to tell TCYK anything and, as we have pointed out before, if the subscriber didn’t carry out the offense and did not authorize anyone using his connection to do so, he or she is not liable under the Copyright Act. Also of note is that these days it’s common, considering access for both family and friends, for more than a dozen people to use a residential WiFi. It’s certainly possible (“on the balance of probabilities”) that a court would recognize that too. Another common feature of UK cases (and upcoming Aussie cases) is that the courts ask trolls not to ask for money in their first letter. TCYK stick to that format but clearly advise that their next letter will contain a demand. After inviting the letter recipient to confess (or snitch on someone else), TCYK says it will arrive at a settlement figure based on what it gets told. “We will propose an appropriate figure to you in the subsequent letter after we have received your response to this letter and carefully considered its contents,” TCYK writes. As always, letter recipients are invited to read the Speculative Invoicing Handbook (pdf) and remain acutely aware that everything revealed to companies like TCYK will be used as leverage against them. The really wise advice is not to communicate with them at all. UK solicitor Michael Coyle from Lawdit Solicitors is again stepping up to the mark to defend those affected by this latest wave. “I’ve been sent many emails from people who have received a letter of claim from TCYK. The letters are very similar in format to the letters sent in previous campaigns and once again assume that copyright infringement based on the identity of the person who pays the bill,” Coyle informs TF. Letter recipients in need of assistance should contact Michael at Lawdit Solicitors. A charitable donation to his fund-raising campaign will secure legal advice. This week we have only one newcomer in our chart. ‘Jurassic World is the most downloaded movie. Playing old console games through browser-based emulators is a niche pastime of some of the most dedicated gamers. 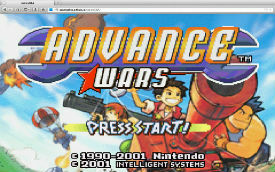 For Game Boy Advance fans there are a few websites that offer such a nostalgic trip down memory lane, free for all. Unfortunately, Nintendo is less pleased with the fan-made projects. This week the company took down a popular Game Boy Advance emulator that was hosted on the developer platform GitHub. While fans may like it, Nintendo sees the site as blatant copyright infringement. 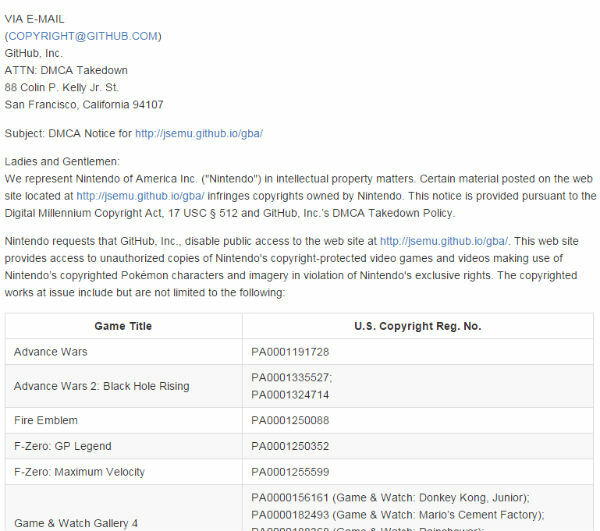 “Nintendo requests that GitHub, Inc., disable public access to the web site at http://jsemu.github.io/gba/,” Nintendo writes in their takedown notice. Shortly after GitHub received the takedown notice the Game Boy Advance emulator was shut down. The user who hosted the files also appears to have removed his GitHub account, possibly to avoid any further trouble. The above means that nostalgic Game Boy Advance fans will have to dust off their old consoles again or find another way to play their classics. Interestingly, the code for the Game Boy Emulator itself, without the pre-loaded games, is open source and still hosted elsewhere on GitHub. Several copies of the full site are also still floating around. This is not the first time that Nintendo has gone after a Game Boy emulator. The same happened with the popular iOS application GBA4iOS, which the company nuked in a similar fashion last year. Earlier this year the long running lawsuit between the RIAA and music streaming service Grooveshark came to an abrupt end. Facing hundreds of millions in damages, Grooveshark shut down agreeing to pay the record labels $50 million. This was a huge blow to the site’s users, many of whom had spent years carefully curating their playlists. Among the affected users was a group of music loving web developers including Ofir Yosef, Itzik Ben-Bassat and Ziv Waksman, who decided to come up with a solution without breaking the law. “It was devastating at first as we thought that we’d lost our personal music hub. The huge effort that took many years to build and collect songs and playlists was gone in a single court decision,” Yosef tells TF. The initial thought was that all playlists were gone forever. However, there was still a Grooveshark backup server online and Yosef and his team quickly secured all playlist data. That’s when the real challenge stated. A collection of .XLS files is useless if they can’t be linked to the actual music track, so Yosef and his team started coding. Now, several weeks later StreamSquid was born. “StreamSquid is a free music streaming service that lets you discover, create and share the music you love. It’s the easy way to play the music you want online, legally and free,” Yosef says. “And now it also lets you import your lost Grooveshark music and start listening to it almost immediately,” he adds. The service is indeed quite impressive considering that it’s a mashup of various sources. It has an intuitive user interface that makes it easy to discover and curate music. 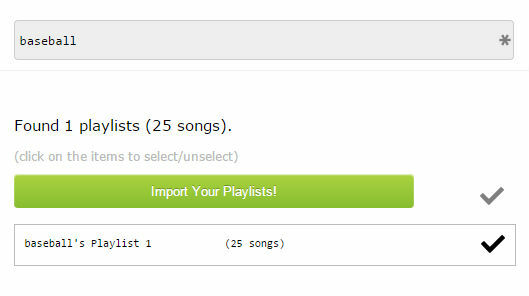 Grooveshark users will be delighted as well, as they can restore their old playlists in one click. To present the music in an appealing format, with album lists and prearranged playlists, StreamSquid partnered with Last.fm. 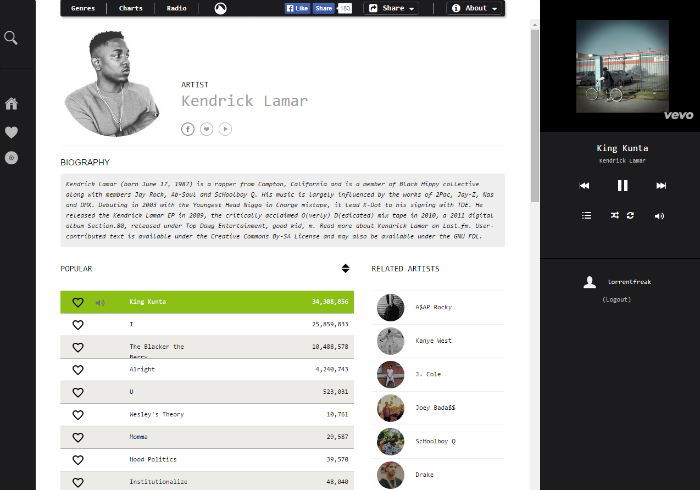 In addition the site also allows users to easily discover related artists and browse through various top charts. For the long-term StreamSquid is planning to add support for mobile listening as well, including apps, but currently the focus lies on implementing features to improve the general user experience. As for legality, StreamSquid doesn’t anticipate any problems. The service pulls its music from YouTube and SoundCloud and doesn’t host any media content on its servers. “StreamSquid is legal. We use YouTube and SoundCloud APIs to stream music legally and meet all requirements and terms of services. Everything is double checked,” Yosef says. Similar to Grooveshark, the service will remain free of charge. The self-funded team may consider adding monetization options in the future, such as offering links to Amazon and iTunes stores, but these will be aimed at adding value to the users. Aside from the occasional bug StreamSquid seems to work rather well. And for former Grooveshark users it will be a welcome reunion with the tunes they deemed lost. Google receives millions of requests every week to have links delisted from its search results, largely following claims from third parties that the referenced content infringes their rights. While it’s difficult to say what proportion of these claims are erroneous or duplicate, it’s likely to run into thousands per month. Other claims, like the one we’re highlighting today, underline why we absolutely need Google’s Transparency Report and the DMCA notice archive maintained by Chilling Effects. The episode began on July 1, 2015 when an individual contacted Google with a complaint about a page hosted by the BBC. Found here, the page carries a news report from 2009 which reveals how a man called Kevin Collinson with two failed disability scooter businesses behind him was allegedly (and potentially illegally) running a third. The article is a typical “rogue trader” affair, with tales of aggressive sales techniques, broken promises, faulty goods, out-of-pocket customers and companies that dissolve only to reappear debt-free shortly after. Unpleasant to say the least. So what prompted the complaint to Google that was subsequently published on Chilling Effects? Well, it was sent to the search giant by a gentleman calling himself (you guessed it) Kevin Collinson. Nevertheless, the important thing is this – has the BBC infringed his rights? Collinson thinks so. 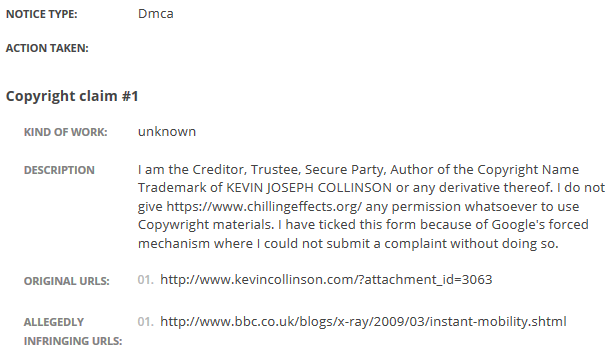 As highlighted by the image above, when asked for the source of the infringed material, Kevin Collinson links to a page on his domain kevincollinson.com. 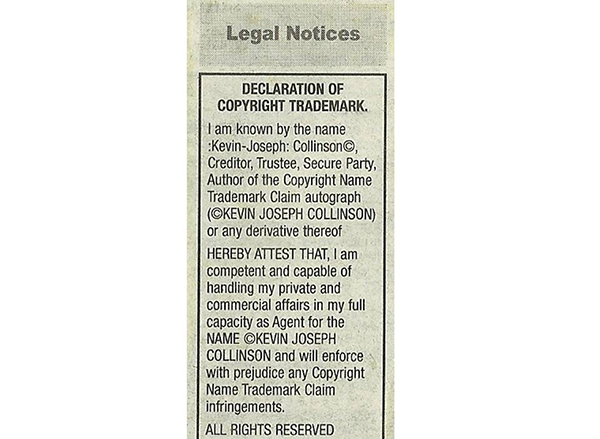 It contains the image below which apparently proves that Collinson owns a “copyright name trademark” to his own name, whatever one of those might be. Reading between the lines, Collinson seems to suggest that since he has a trademark on his name (searches in UK databases draw a blank incidentally), outlets such as the BBC aren’t allowed to report news containing his name. Complete nonsense of course, and Google hasn’t removed the page either. That said, under UK law people are indeed allowed to trademark their names. Perhaps surprisingly, trademark UK00002572177 (EU009734096) is registered to Wikileaks’ Julian Assange and protects him in the areas of public speaking, news reporting, journalism, publication of texts, education and entertainment services. Professor Stephen Hawking also has a couple of trademarks protecting his name. Coincidentally (and possibly of interest to Mr Collinson) one of those covers mobility scooters and wheelchairs. KEVIN JOSEPH COLLINSON did not respond to TorrentFreak’s request for comment. Last May, Grooveshark shut down after settling with the RIAA. However, within days a new site was launched aiming to take its place. The RIAA wasn’t happy with this development and quickly obtained an injunction, preventing various Internet service providers from offering their services to the site. Through the lawsuit the companies hope to prevent further copyright infringements, but there is more at stake. Much more. The case is also the first major test of how receptive the courts are to the notion of injunctions against hosting companies, domain name services, ISPs and search engines. Fearing that these attempts may become commonplace several tech companies protested the injunction, including CloudFlare. The court order requires the CDN-service to ban all domain names that use the term “Grooveshark,” which the company believes is too broad. This week CloudFlare informed the court that the order limits free-speech, impacting legitimate customers who use it for perfectly legitimate websites. “CloudFlare has already been compelled by the injunction to deny service to at least one website that is plainly non-infringing, and to others that are arguably non-infringing and have no discernible connection with the Defendants in this case,” they write (pdf). 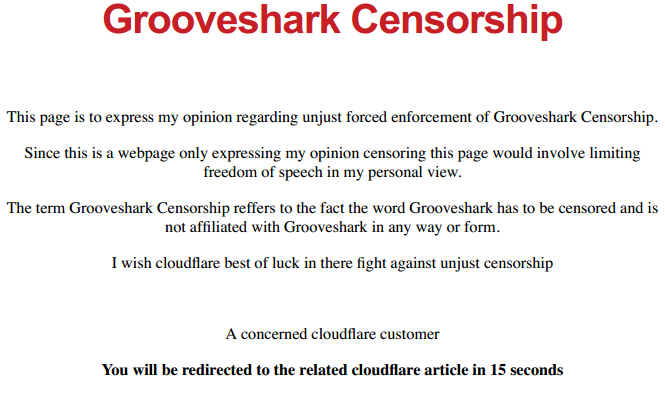 As an example, CloudFlare says it had to terminate the account of “groovesharkcensorship.cf,” a site which protested the broad injunction as the screenshot below shows. 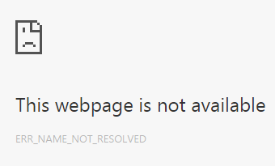 Under the injunction CloudFlare had no other option than to disable its services for the domain, rendering it inaccessible. In an email, the company informed the affected user about its actions explaining that it’s not allowed to provide any services that use the Grooveshark trademark in a domain name. According to CloudFlare many other legitimate sites may be at risk of being censored if the broad injunction is upheld. Despite these protests, the record labels maintain the position that the measures are “entirely appropriate.” They argue that it’s up to CloudFlare to determine whether a domain name is infringing, and consult the record labels if there’s any doubt. For its part, CloudFlare wants the court to modify the injunction so that they only have to target domain names which the record labels point out to them, instead of banning the word Grooveshark altogether. Shortly before publishing this article the court ruled (pdf) on the dispute, largely in favor of CloudFlare. 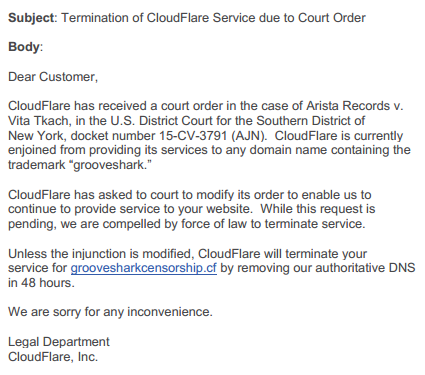 In a ruling issued a few hours ago District Court Judge Alison Nathan clarifies that CloudFlare is no longer required to ban all Grooveshark-related domains. Instead, the record labels must alert the company to possibly infringing sites. However, Judge Nathan adds that if CloudFlare has knowledge of an infringing domain name it is required to take action on its own. So, in the end it appears that the censored anti-censorship site has served its purpose. At the time of writing it still remains offline, but this may change during the coming hours. After launching his site Wawa-Mania in 2006, it took just three years for Dimitri Mader to attract the negative attention of the authorities. After the Association Against Audiovisual Piracy (ALPA) identified more than 3,600 films being made available via the site without permission, Mader was detained in 2009. This April, Mader was sentenced to a year in jail and was fined 20,000 euros for his role on the site. The 26-year-old heard the news from his home in the Philippines where he lives with his family. Earlier this month the Frenchman was bracing for more bad news as a court deliberated on the damages he’d have to pay to mainly Hollywood companies. In the event, claims from Columbia Pictures, Disney, Paramount, Tristar, Universal, Twentieth Century Fox, Warner Bros and Microsoft were largely upheld by the court and Mader was landed with a $17m bill. Following the ruling, TorrentFreak caught up with Mader. What’s it like to have a jail sentence pending in another country? How does one react to a multi-million dollar invoice landing on the table and how does that affect the future? “First I smiled, the amount is far from what I expected,” Mader told TF. The amount is certainly huge, even beyond the damages currently outstanding in the famous Pirate Bay case, and that’s with nine years of accruing interest tagged on. But to anyone of limited means, a million dollars may as well be a billion dollars – the amount is never going to get paid. As a result, Mader says he will remove it from his thoughts. “[The copyright holders] know that to get the full payment or even 10% of it is something impossible. I will just drop that from my mind, the criminal verdict is enough to cause worry,” he says. Even if Mader manages to clear the damages from his mind, there is still the serious matter of the one year jail sentence handed down by a French court in April. Will he return home to face the music? “Returning to France is complicated. 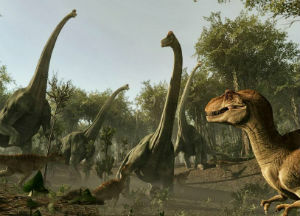 I haven’t been back there for four years and now I need to provide some documents that I can’t get easily,” Mader says. And getting that sorted would be a priority. Mader has a wife and child in the Philippines and that only complicates matters when considering a return to France. “I need also to provide papers for the registration of my wife and kid. It’s a mess. I can’t afford to leave them here alone and I have no guarantee that [French authorities] will let me leave once they have me,” he explains. Additionally, there’s the not insignificant matter of what happens to Wawa-Mania. The court wants the site closed down but Mader suggests its future could be the subject of a quid pro quo arrangement. “[Its future] depends on the success of my new development and/or the possibility to come back to France as requested,” he says. While Mader faces an uncertain future, his parting comments paint an even more bleak picture for the destiny of the Internet. “I have no doubt about what the Internet is going to be. A Web 3.0 fully under the control of a few IT giants, regulated by other corporations and government. “They gonna tell you where to go, what to watch, what to listen to, what to read, what to think and, most importantly, where to enter your credit card number,” he warns. There’s a slight panic breaking out among Google Chrome users. Over the past few hours the browser has started to block access to several of the most popular torrent sites including KickassTorrents, Torrentz, ExtraTorrent and RARBG. Instead of a page filled with the latest torrents, visitors are presented with an ominous red warning banner. “The site ahead contains harmful programs,” Google Chrome informs its users. 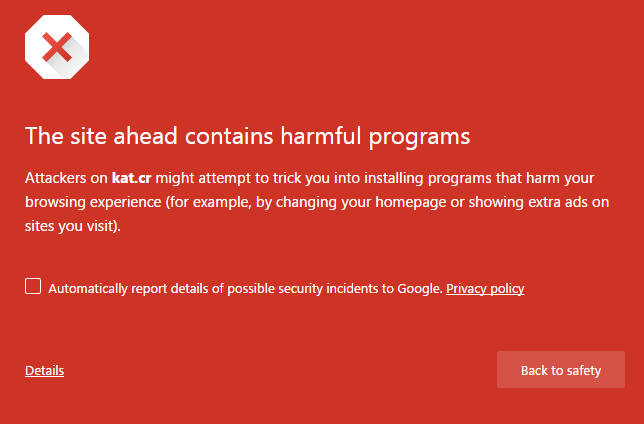 “Attackers on kat.cr might attempt to trick you into installing programs that harm your browsing experience (for example, by changing your homepage or showing extra ads on sites you visit),” the warning adds. Google doesn’t specify what the issue is with the sites in question. The “Safe Browsing” diagnostics pages only list the sites as “suspicious” and note that “third parties can add malicious code to legitimate sites.” in some cases. The owners of the sites in question are clueless about the source of the problem. RARBG’s operator informs TF that there is no additional information available in Google’s Webmaster tools either. “I hope Google comes to its senses and actually allows webmasters to see what the issue is in their webmasters tools,” RARBG’s operator informs us (update: after publication some more information did appear in webmaster tools). ExtraTorrent is not aware of any issues either and notes that the malware Google reportedly found are false positives. “There is no malicious software and you are still able to load ExtraTorrent in Mozilla Firefox, Opera, Chromium and other browsers,” the ExtraTorrent team says. “We’ll contact Google to resolve the issue shortly,” they add. Interestingly, several proxy sites, such as torrentz-proxy.com, still work fine and don’t show the warning screen in Google Chrome. Since Google doesn’t mention “malicious software” as the reason for the warning, it was most likely triggered by the “unsafe” ads many torrent sites run. These are typically linked to toolbar software or other unwanted programs. We reached out to Google to find out more about the sudden torrent site blocks, but we have yet to receive a response. 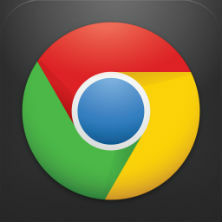 Chrome users who want to bypass the warning can do so by clicking the details link, or disable Chrome’s malware warnings altogether. Update: Some people report that Firefox also started blocking access to several torrent sites. Update: ExtraTorrent says it successfully resolved the issue with Google through webmaster tools. RARBG is also unblocked. Update: Google didn’t comment on this specific situation and referred us to a recent blog post.